​CENTERVILLE, Ohio – May 1, 2016 – Forte, Centerville High School’s premier a cappella ensemble, returns to Centerville as National Champions. On Friday night, April 29, 2016, Forte took first place at the International Championships of High School A Cappella (ICHSA) Finals at The Town Hall Theater in New York City. Forte competed against the top 10 high school a cappella groups in the country. To get to the finals, they won the quarterfinal round of the ICHSA in February and then won the Midwest Semifinal in Dekalb, Michigan. Overall, they beat over 150 groups across the country to be named the international champions. Along with being the overall champions, Forte senior Justin Crichfield was named as the top Vocal Percussionist. This is Justin’s second consecutive year to be named as the best high school vocal percussionist in the United States. Ryan Nichols, also a senior, won the best overall soloist at both the quarterfinal and semifinal competitions. 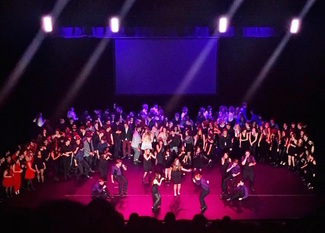 Forte won first place for Choreography at the finals. With them, they are bringing home The Gooding Cup. 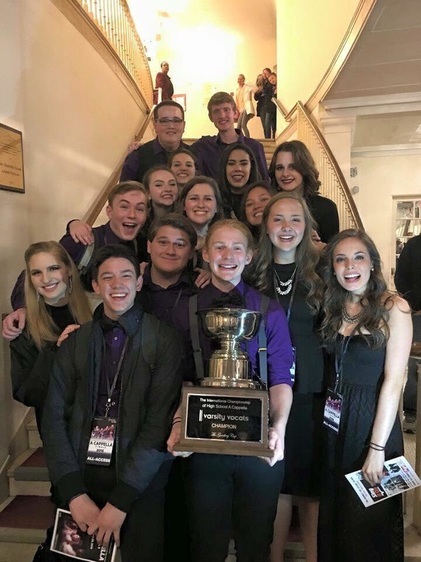 Created by the maker of the Grammy Awards and named for the benefactors of the competition, The Gooding Cup is a symbol of innovation and excellence in a cappella and is the trophy for the competition. The winning group has its name engraved on the trophy and gets to display it at their school for a year. The ICHSA, as well as the collegiate version (ICCA), are the only international tournaments that showcase student a cappella singing. The ICHSA was founded in 2001 out of a growing interest in a cappella singing at the high school level and has seen an explosion of participation with 150 groups competing this year. Forte is the premier contemporary a cappella group at Centerville High School in Centerville, Ohio. The group is under the direction of Ben Spalding. Besides winning the ICHSA this year, they have been the national runner-up the other three times they competed. In 2015, they opened for the national Sing-Off Tour in Cleveland, Ohio. They recorded a music video with Grammy-winning artist Kirstin Maldonado of Pentatonix and performed live with pop star Jojo on her national tour. Forte has released seven albums and was the first ever high school group to release a CD of all original songs, written by its members.